The Feel Free Roamer 1 is a superb sit on top and ranks amongst the very best available. The Roamer 1 has a great hull for either surfing or exploring up an estuary, canal, and river or around the coastline.. The Nomad Sport is the a modern general purpose sit on top for paddling on the sea and inland waters. Great fun for all the family to enjoy. The Flow is a versatile all round single sit on top kayak. 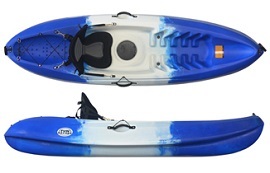 Fun Kayaks Flow is only available for Mail order, and is not available to buy in-store. These orders are shipped directly from the Fun Kayaks central warehouse facility. Formerly the Perception Scooter, the Wavesport Scooter is one of the UK's best selling sit on tops. The Scooters WhiteOut seat gives good padding and back support plus room for a child to sit in front of you. The Triumph 13 has replaced the well known Freedom. The Triumph is an all new sit on top. The hull has come from the Perception Touring Kayak range, to provide a stable but responsive and speedier hull. 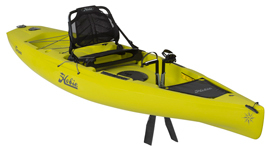 The Fun Kayaks Cruise Angler is a lightweight, feature rich touring and fishing Sit On Top Kayak. Light, short and compact makes it great for storage and transport, ideal for paddling and fishing inland waterways and sheltered coastal conditions. Stable, lightweight 10ft sit on top that's great for flat water paddling on the sea and inland waters. Features include a large bow storage hatch and a Wheel in the Keel. The Feelfree Move is the perfect kayak for children and smaller adults alike. 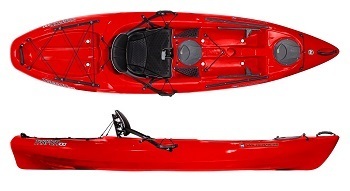 The Move is a compact and versatile sit on top kayak. The Tarpon 120 is a great touring & fishing sit on top. It has very unique features that has made it one of the most poular sit on top on the market. 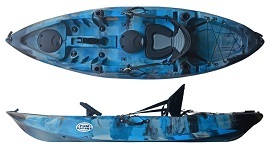 The Feel Free Moken 12 is a feature packed Sit On Top Kayak for sit on top kayaking and kayak fishing. The Moken 12 offers great speed and directional stability and for touring. Hobie Mirage Drive Kayaks offer a 'hands free' solution to kayaking. These kayaks can be controlled by pedalling, leaving your hands free for fishing, photography and more.